Johannesburg — South Africa's tourism is set to benefit from the first mosque built in South Africa to cater for the Turkish Islamic community, President Jacob Zuma said on Thursday. Speaking at the official opening of the mosque - a first on the continent of Africa and the largest religious complex in the southern hemisphere - Zuma said the facility will help create greater understanding and tolerance between diverse religions. In Istanbul, Turkey's largest city, The Blue Mosque (Sultanahmet Camii in Turkish) is an historical mosque that has over the years become a popular tourist attraction in that country. 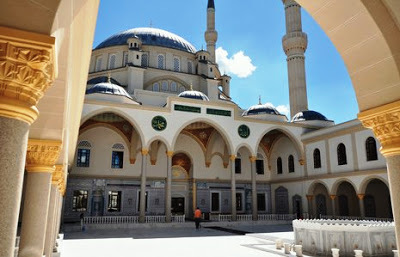 The mosque is known as the Blue Mosque because of the blue tiles surrounding the walls' interior. In South Africa, the Nizamiye Complex is the brainchild of 74-year-old Ali Katircioglu, a prominent Turkish businessman who came to South Africa four years ago. Before the commencement of the project, Katircioglu met with former President Nelson Mandela, who recommended that a clinic be built near the mosque. A school has also been added to cater for about 800 learners. Both the clinic and the schools will be open to the public. "We are truly honoured that members of the Turkish business community have chosen South Africa for this historic Nizamiye Complex," Zuma said. "It will further enhance economic and tourism development between our two countries." The mosque would advance the promotion of religious tolerance and will build on the productive diplomatic relations between South Africa and Turkey that have existed since 1991. Beyond the economy, Turkey and South Africa share many views on global platforms. The two countries are both members of the G20 and as a non-permanent member of the UN Security Council, Turkey has been a prominent voice supporting Africa inside the council. "Like South Africa, Turkey supports the restructuring of the United Nations Security Council. We also welcome and appreciate the role Turkey continues to play in the advancement of the African agenda." Gauteng Premier Nomvula Mokonyane said the facility would not only boost tourism for South Africa but would also contribute to the growing economy of Gauteng and the country. "This facility that we are opening today is a boost for our country and a confirmation of our strong partnership with the Turkish community," she said. Economic Development Minister Ibrahim Patel said Islam continued to play an important role in South Africa. "This opening celebrates the growing economic relations between these two great nations. This is Africa's largest economy blessed with enormous opportunities for investments and already we have seen Turkish businessmen pouring into South Africa," Patel said.